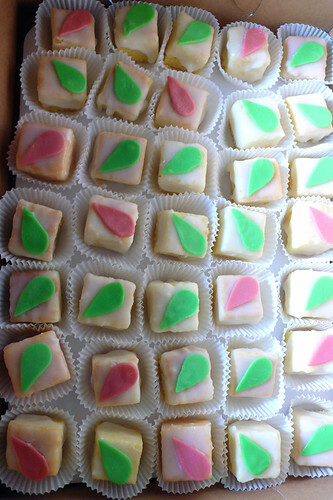 the scent of green bananas: simple and pleasing petit fours. Posted by santos. This entry was posted on 20070821 at 9:58 PM You can skip to the end and leave a response. my little girl is so fascinated by these. I think her next yellow-coated endeavor may be mud petit-fours! 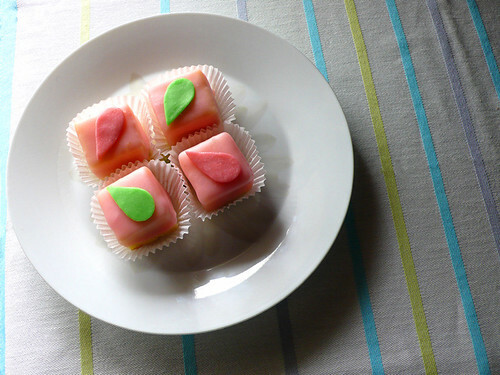 (also thinking polymer clay petit fours might make nice birthday presents for her pals) my best to you! Wow - that's a whole lot a tips - thanks! I haven't made these in over 30 years... it may be time to revisit them. I wonder how good chocolate rolled fondant is? they're so pretty! I'm so impressed. don't think I'd ever have the courage to attempt such a thing. I love you blog and post! Thanks for including me in one of tyour links. I wanted to talk with you! Please email me at sarah@baking911.com I couldn't find your email! Thanks! Santos, these are so lovely! 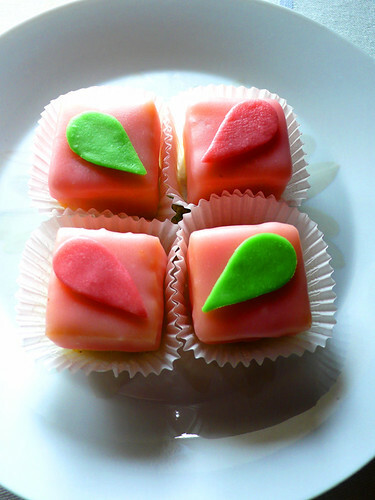 I have never made petit fours but have always thought about it. I love how delicate and beautiful yours look. They are so cute. I love the colors! cathy! and you don't have to be in a cast this time around! hello anne,i hope you try these, i know you'd do a beautiful job of it. 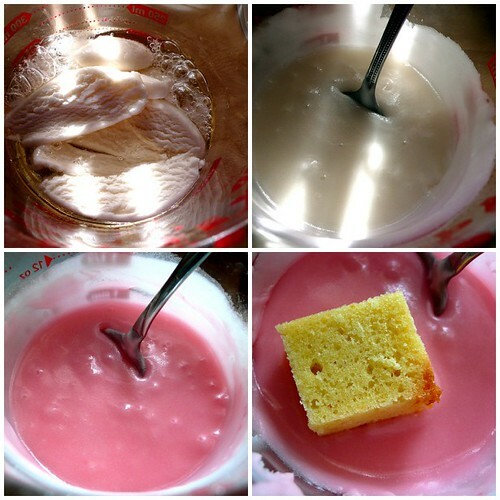 stephanie, i was hesitant at first as i've had trouble with icings and fondant before, but once i started i quite enjoyed the whole process. i think you might too! 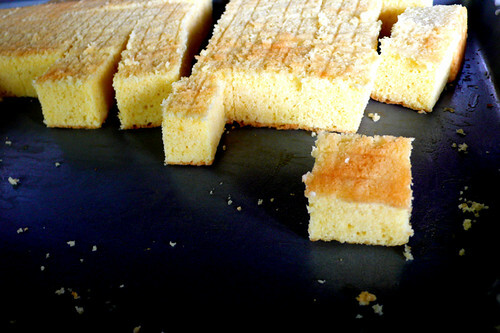 hello sarah, thanks for stopping by and commenting--baking 911 has been a cake saver on more than one occasion for me! hello patricia! i don't think i'll ever be able to do the fancy gum paste flowers and intricate piping that some people do, so i'll just have to improvise with what i've got. I love the way you say "simple". They are beautiful and so patrician, heh. (laughing) 'simple' is such a relative term....it changes daily too! 'patrician' !!!! excellent, acornbud. and true. Wow- this post (along with the fondant one) is very educational for me!!! 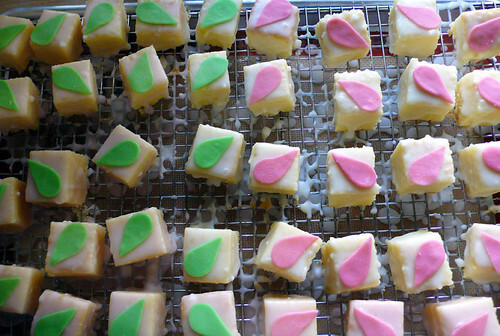 I looove petit-fours and now will be able to make them! Thanks! 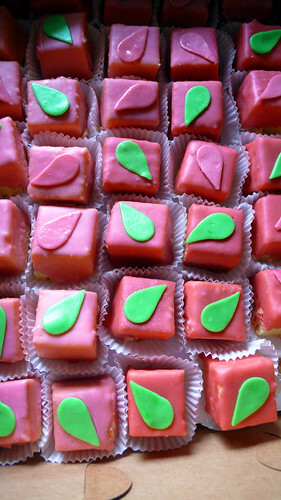 I came across this post via Google search for petits fours. This will be my first attempt and I really appreciate the detailed post. I will be making 3 dz or so for Valentine's Day but I think I should do a practice run with a small batch beforehand.